I had to send a picture of this one to my friend Amy, aka Scraparazzi and ask her what else it needed. We decided the lighter color strip along the back and the faux stitching was exactly what the card needed to break up the plaid and make it look more finished! 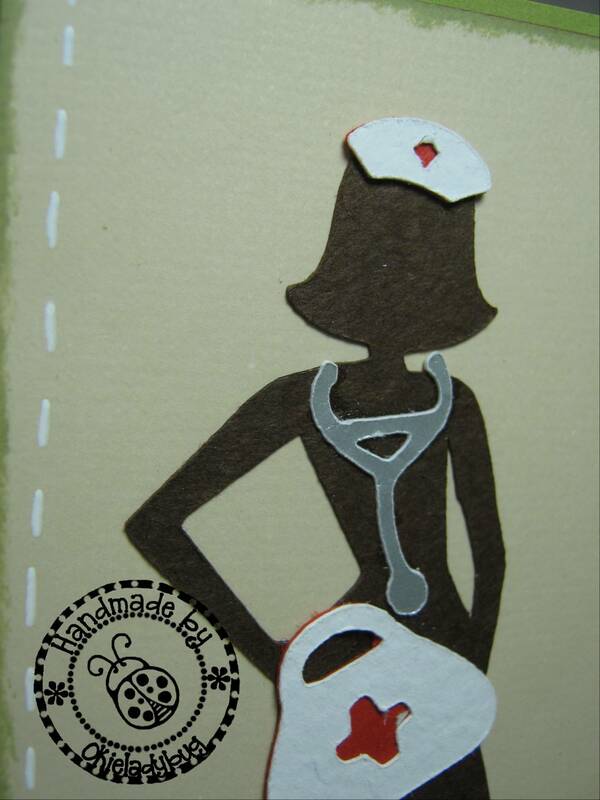 The medical equipment is all from Everyday Paperdolls. I used Design Studio to adjust the items to the sizes I needed. It is hard to tell that the nurse hat has a little red cross on it since it looks like a diamond but I guess it will have to work. At least the cross on the medical bag cut a little better. The gal did have a dress on and I started to cut out the dress and put it on her but then I thought it went against the whole design of the other cards so I just cut that sucker off of her. I will be at a conference for work all day today so I might not have time to approve comments throughout the day but I will be reading them when I get back home. OMG, I almost spewed coffee all over my keyboard when I read that one, love it!!! Would that get a man out of his hospital bed and on his feet or keep him on his back in hope of seeing that nurse? My favorite! I LOVE LOVE LOVE this one!!! My FAVE! LOL! I am enjoying all these "naughty" cards. I also enjoy your blog and your style of writing. This is another terrific one!! I agree, that strip of white helps to accent the plaid. Great job, and so funny! LOL!!!! OMG!! This is Fabulous! OMG!!!!! That is too funny!!!!! YOU ARE SOOOOO BADDDDDDD!!!! I love it!!!! This is my favorite. My husband is a Doctor. This is just great! These get better everyday -- how do you do it?!?!? LOL good grief girl you are too funny!!! laughed so hard i spit out my diet coke all over my keyboard!!! You are the best to brighten my day, Love the cards. Oh Yes, just when I thought they couldn't be much better ... you top yourself. I'm thinking I could use an organ donation too! But this still isn't my fav. OMG! This one is my favorite!!!!!! I am loving your series but this is by far my favorite! OMG! ROTFL! I need me a nurse - preferably a male nurse please! oops, I didn't see the "need your" on the card front at first. Girl, this card is rockin! You really outdone youself. I love your cards anf this one is really, really, creative. TFS! You crack me up! I've loved all of your Naughty Girls and have been inspired to create a few of my own. Hubby has a birthday soon and I'm sure he would love a "Naughty Girl". Thank you for sharing your awesome sense of humor; please don't ever lose it. PS: I left a comment earlier this week but it never posted. I promiise it was NICE! LOL! Awesome card! Being a nurse I can appreciate the humor! Hope you get to feeling better soon!